Flowing metallic print designs grace this sheet of screenprinted Lokta paper featuring drops and ripples in metallic copper on a dusty pink colored base paper. Nepalese paper artisans hand-craft Lokta paper out of fibers from the bark of the Lokta bush and then silkscreen the eye-catching designs onto the sheet. These 6" and 9" square packs make a unique option for origami foldings and other small projects. Nepalese Lokta Paper is a strong, durable and eco-friendly paper handmade from the fiber of the "Nepal Paper Plant," also called the Daphne Shrub or Lokta Bush. The fibers are long and flexible providing exceptional strength for origami foldings and other small projects. 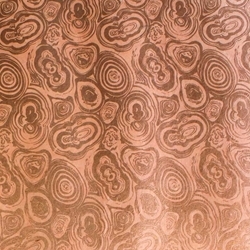 This neutral ph lokta paper starts with a dusky pink base color and overlays a pattern of metallic copper drips and ripples filling the page. The paper fibers provide texture and angles for dramatic light effects creating a rich, opulent look.